A Harry Turtledove cover without historical people standing around looking historical in an alternate history story. This cover needs some Sigmund Freud. Wolfman is just out trimming his hedges and yelling at spaceships flying by to fast. Happens to everyone eventually. @fred. Indeed, why is the blue lion man not in a Civil War uniform? I am confused. Er, can we not make dreams a reality, please? Last night, I dreamed that Donald Trump announced that all whales would be killed so we could use space in their teeth for nuclear waste storage. Her pose is a bit off. Her body and shoulders suggest movement, yet her left hand is balanced delicately on a rock, suggesting she’s just standing up or treading carefully towards the TransAmerica Pyramid. Logo bars: A small subject we haven’t delved into. Notice the thick bars placed underneath the titles and/or the author names on lots of covers? What’s up with that? Someone at the editor’s office thought, “We need to fill in that space”…? Protecting what little possible inheritance is remaining, lion guy valiantly stands between his crazy uncle and unscrupulous giant Jenga block salesmen. The Blue Man Group let him go years ago because of his anger issues. Rory Rory tell us a story, Rory Rory tell it like it is. Looks like she’s about to fling a Del Rey frisbee at blue boy’s head. Jennifer’s pose suggests that the background stuff is all really happening but she’s dreaming about going bowling. @THX: You win this thread. Is her lower left arm out of proportion with every other part of her body? @DStuff WBT—I believe she has an advanced case of “Frisbee Forearm,” ©️a painful elongation of the ulna and radius bones caused by too much flinging. You see it in many Ultimate Frisbee veterans, usually when they are standing on line for their unemployment checks. The massively dense Del Rey frisbee is frequently cited as a leading cause of Frisbee Forearm©️. 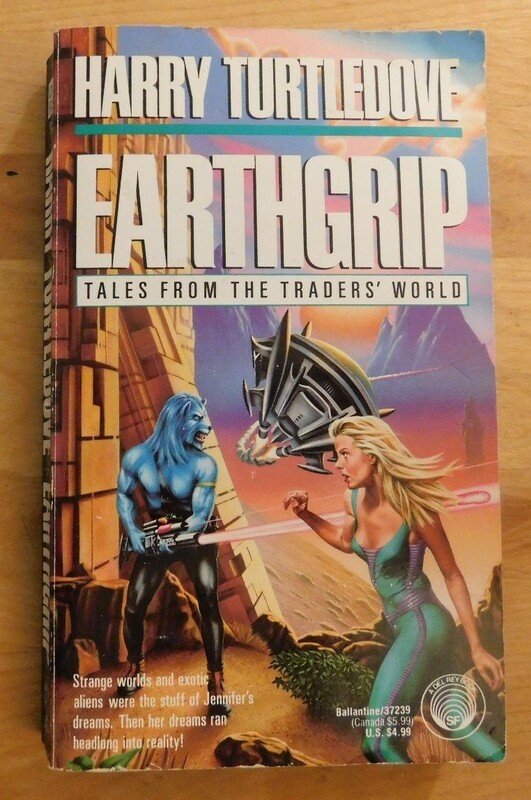 I wonder if spandex future fashion will become a self fulfilling prophecy due to it’s proliferation on sci fi book covers. It looks like that spacecraft has harnessed the power of forced perspective. So much so that the rocket flames converge immediately behind the ship! @Yoss: What forced perspective? That’s a flat pie-shaped space ship hovering over the shrubbery, shooting exhaust at the face of the blue fellow, who is snarling so terribly the exhaust peels off into the background. Perhaps she’s supposed to fight the blue fellow and then move on to the next level, BUT due to a programmer’s oversight she can wall hack and cut round him while he performs his pre-programmed attack pattern. Why is she dressed like she just came from an eighties-themed party where she tried to make an effort to dress up but failed? Ah, back when Harry still wrote actual SF. Which he was good at, but apparently doesn’t rake in the enormous bucks. Agreed it’s not forced perspective, it’s a tiny triangular ship. Probably a futuristic drone which blue guy wants off his pyramid’s lawn. You can tell it’s not BAEN!pew pew because Jennifer’s got a reasonably-sized bust. Is it me, or does the lion guy look like he’s got his head twisted around? Now that you mention it, his neck and head do appear to attach wrongly. That’s gotta hurt. No wonder he’s so shooty. Maybe he suffered this in the same transporter accident that lengthened Jennifer’s arm.